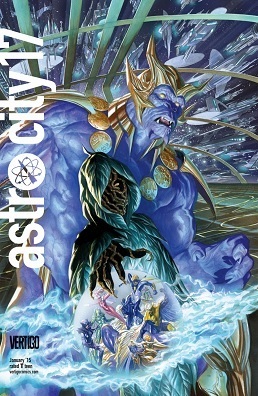 The Sentry is an extremely powerful superhero who was created in 2000, but paradoxically has always been a part of the Marvel Universe, it's a massive retcon that involves wiped memories, but in his original miniseries and one shot tie it's revealed that a picture of him earned Peter Parker a pulitzer, he helped the Hulk control his rages and and got the public to love Hulk, and he was Reed Richard's best friend outside of the Fantastic Four. There were some neat ideas in it, exploring what the Marvel Universe would be like in different eras with a Superman type character, and if it was a What If or it had been limited to that one Marvel Knight's event, I would 't give it a second thought. But in 2005 Brian Micheal Bendis reintroduced the character in 4 issue arc of The New Avengers, and while I think the arc was pretty well written and had some sweet touching moments I think the Sentry's canon existance is a bad idea in general. 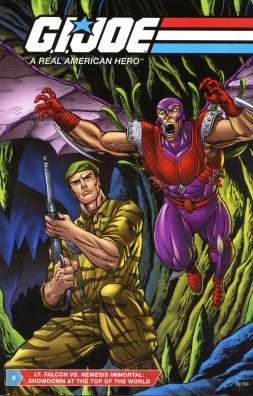 During the Battle of Cobra-La, LT. FALCON goes one-on-one against the menacing blood-sucking NEMESIS IMMORTAL creature. The G.I. JOE team's quick-thinking infantry specalist has to stop the monster if he and his men are going to have any chance of escape!" In 2008 Hasbro released a set of 8 two character action figure toy packs featuring comics with all new stories about the GI Joe team, many of these are set inbetween issues of the classic Marvel series and provide extra background detail on one or more characters and are quite interesting... but what happens when you ask Larry Hama to write about a character who never appeared in any of his comics? A Character from a group that he expressly fought against including in the original series run? Nemesis Enforcer Immortal. Unlike a lot of my other entries, I had very, very little trouble deciding what moment to pick for this theme. John Byrne's The Sensational She-Hulk is, so far, the only Marvel comic I have anything resembling a hang on. And I've loved almost every last bit of it. The book struck just the right balance of humor, action, and cheesecake, all wrapped up in plenty of Fourth Wall-breaking goodness. And unlike many other iconic superhero runs, it ended on an incredibly strong note: Byrne killing off himself. That time when Godzilla played basketball with Charles Barkley. Or, excuse me, that time when Godzilla got busy. Note his fine form on the layup, helped, no doubt, by his Godzilla-feet shaped (Nike) sneakers.